The smartest operative on the hill just got played by Grampa Simpson. (SPOILERS) John Madden’s name as director might be a clue that this exploration of the world of political lobbying isn’t going to be altogether successful; one might give a pass to his inoffensive pensioner pictures (The Best Exotic Marigold Hotel and its sequel) but otherwise he hasn’t delivered a truly satisfying feature since the Oscar glory that (rightly) greeted Shakespeare in Love. As usual, he’s only as serviceable as his screenplay, and this one is all sorts of uneven. 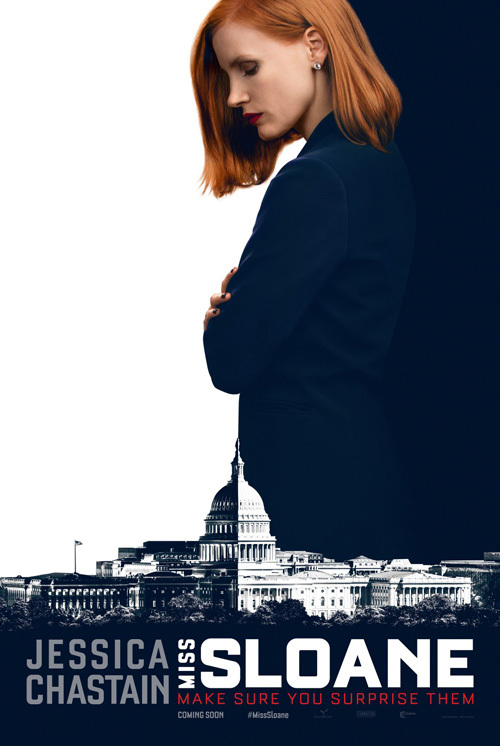 Jessica Chastain’s title character is a too-familiar cliché, the workaholic career woman with no time for relationships (she hires male escorts to satisfy any carnal cravings) and less time for small talk. Everything is a calculated move, as the introductory scene tells us, predicting your opponent’s move before they predict yours (“It’s about making sure you surprise them and they don’t surprise you”), and she applies this maxim to all aspects of her life. There’s a rather crafty resulting twist, rather proving her point, but it only succeeds in being a crafty twist because the picture is so wayward and uncollected that you’ve long since forgotten her “ethos” by the time she reaches the point of proving it. And the worst thing about Madden’s movie, by Jonathan Perera, is that it insists on giving Sloane a good heart, despite being part of a ruthless, inherently corrupt industry (she’s “the poster child for the most morally bankrupt profession since faith healing”) and willing to manipulate and betray colleagues in order to shoot for the bigger prize. We’re supposed to give her a big huzzah at the end, but I wish first-time screenwriter (or first time with a produced screenplay anyway) Jonathan Perera had stuck to the guns of his premise. Much of the dialogue in the round-table discussions with her juniors reeks of artifice calculated to give Sloane over-scripted put-downs and a superior seen-it-all, done-it-all voice; the only positive side of this is that in scenes where there is actualartifice (her assistant Alison Pill electing not to go with her when she moves to a rival firm), the fakery doesn’t stand out as any differently written. I’m not sure that should be a compliment, though. There’s also something crushingly banal about the subject matter, as if the makers couldn’t have seized upon a more liberal-friendly area and thus one lacking in teeth; even Sloane is opposed to the gun lobby on principle, and not even – as others keep insinuating – because she lost someone close to her. Everyone on the pro-gun side is morally indefensible, and everyone besides Sloane opposed to it is whiter-than-white. The only note of dissonance is cast by her lawyer (David Wilson Barnes) who, once the bill requiring universal background checks on gun purchases has gone through, taking down corrupt senator John Lithgow with it, observes “Congratulations, criminals must now endure the hassle of procuring their guns on the black market”. Being spoon-fed by movies, particularly ones purporting to have a brain in their head, is never satisfying, and this one singularly fails to be inventive with the big issues, with the rival lobbying firms resorting to fairly unremarkable tactics. At one point, Perera, desperate for something to pep up the plot, has Gugu Mbatha-Raw (survivor of the “Bloomington High School Massacre of 1998”) menaced by a gunman who is then shot dead by a member of the public. In the aftermath, having been singled out because she was outed by Sloane as a survivor of the massacre, she comments “It even crossed my mind that this was all you. You just didn’t count on an armed civilian behind me”; now, if the picture had resorted to that kind of extreme behaviour, it might have had something, but as it is, the sequence comes across as a desperately contrived attempt at dramatic incident. There’s support from the likes of Mark Strong, Sam Waterston and Michael Stuhlbarg, none of whom get to be more than one-dimensional. Which shouldn’t be surprising, since neither does the lead character. Who, despite the amount of time to devoted her, fails to come alive or become interesting, either to root for or against. Still, I learnt that it’s possible to remotely control cockroaches for surveillance purposes. If you honk, I’ll spew. No one ties down this Batman forever. Do I look like the Bournemouth Strangler? I know a lot about oh shits. Life is like a box of timelines. You feel me?